A few summers ago, I started to start saving up for travel. I wanted to see the world, but wasn’t sure when or where. I just knew that if the opportunity arose, I wanted to be able to get up and go. Before my last final of the spring semester, I bought a plane ticket to Copenhagen, Denmark, and started planning a one month backpacking trip through Europe. My younger brother, Shaun, decided to come with me and together we visited eight countries including Great Britain, Ireland, Italy, Greece, Switzerland, Czech Republic, Germany and Denmark. We had been traveling for three weeks, and our final destination before the flight home was Hamburg, Germany. Hamburg is a port city in the northern part of Germany. Rivers run through the city, separating Hamburg into small island segments. The city is a hub for trade, and it’s vibrant city life is quite an attraction for foreigners and travelers. But Shaun and I were first drawn to Hamburg because of an email we had received while traveling from two Christian Aid workers who had recently returned there. They had heard about us traveling due to a mass email being circulated – little known to Shaun and I – by my grandmother to workers she knew who lived in the specific countries we were visiting. The hope was for us to meet with locals in the area who loved Christ and could show us around the city. Unfortunately, until Germany, we hadn’t been able to meet with any of these contacts although many of the missionaries had kindly reached out to us. Our new friends, whose names remain protected, suggested we meet for dinner at one of the Afghan restaurants near the Central Station. I readily agreed, glad that we would finally be able to meet some mission workers. 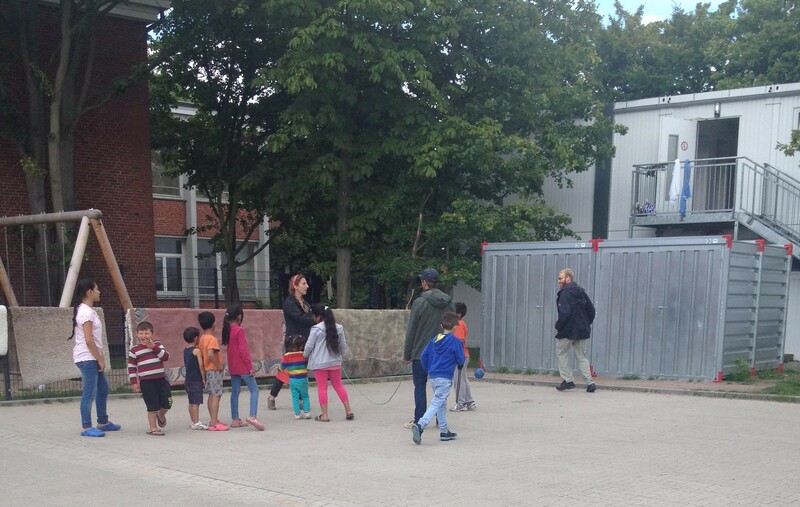 That night, we met with the workers in a part of Hamburg we had not yet seen – the refugee side. Fruit stands, farmer’s markets and Middle Eastern jewelry shops made up this side of town, and walking through these streets we learned that 300 refugees arrive in Hamburg every day, having traveled for months from places like Serbia, Syria, Pakistan, Iran and Montenegro. Many of the refugees are solo travelers, who have left their families behind to seek out a better life. Some had lost their families due to political turmoil or the dangerous journey to Germany. Most refugees seek asylum, the workers told us, with nothing but the clothes they are wearing. Shaun and I told the missionaries we wanted to meet some refugees, so one afternoon , we baked and brought cookies to one of the camps nearby. The kids shyly approached at first, but warmed up to us very quickly – I’m sure the the cookies were a tremendous incentive. Within a matter of minutes, we were playing jumprope, making bracelets and playing “airplane” with all the kids in the middle of camp. Some of the adult men – mainly older brothers or fathers – heard the ruckus and came out to play with the kids as well and we were able to meet them. Parents of the children invited us into their makeshift homes for Coca-Cola and coffee. A man from Serbia led us up the stairs to the top container, where refugees from Serbia and Montenegro temporarily lived. Inside, we saw four women taking care of their infants. As we began talking with them, they told us stories of how they traveled through multiple countries to arrive in Germany. I spoke to a young man named Habib, who told me this was his third time to Hamburg seeking asylum. If he was denied again, he would try going to Holland, maybe. Habib is a Serbian refugee in his mid-20s. His mother, half-brother and stepfather were already in Germany when he arrived. To increase the likelihood of being granted asylum, his mother, brother and stepfather would request asylum status as a family unit—and Habib would seek it alone. As we were talking, two young boys began arguing and wrestling, and he quickly reprimanded them. Tearfully, the boys pleaded and then parted to play with their other friends. Then, Habib started to tell me about some of the struggles within the camp. Disdain between some of the Middle Eastern countries can sometimes cause strife between children and families in the camps. Racism and ethnocentrism were not uncommon. For example, Serbian children might be playing together in the yard and discover another child is from Albania. If one is from Albania and the other from Serbia, Habib said, sometimes name-calling or fighting will erupt and families get involved. As a result, camp coordinators do their best to put families from the same countries together. Habib admitted it was difficult, but he had nothing to return to in Serbia. “I have no house, no job or opportunity. The economy – it’s oppressive,” he told me. Habib’s story was less traumatic than some of the others who were fleeing the Islamic State (ISIS) or wars in Syria with danger behind them and uncertainty ahead. But talking with Habib gave me perspective on what life is like for Germany’s refugees and how great their risk and needs are. Further, I was impressed with the way the city of Hamburg handled the influx of migrants and how the people of Hamburg stepped up to contribute. Because Hamburg is a port city, the city was able to build a place of shelter for refugees utilizing the resources they had quick access to – shipping containers. Charities, mission groups and the church continue to provide for some of the basic food and clothing needs and Hamburg officials are still working toward handling the influx of individuals seeking asylum. More and more individuals seeking asylum are traveling to Germany and other countries across Europe. Germany was the last place we visited before our flight home, and I was immensely thankful that our missionary friends allowed us to see the work and ministry they are doing for these individuals who risk all, have little and are seeking the same levels of safety, comfort and health that we have here in America. Shaun and I ended our journey just two short days later with new perspectives, greater awareness and thankful hearts.